The original recipe in Everyday Food magazine called for chicken drumsticks but I find that bone-in chicken is hard to cook properly with frying. 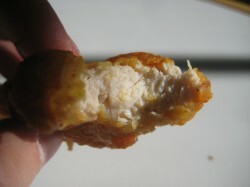 The middle always seems to stay raw, even as the outside gets too brown and, once cooked, there really isn’t much meat on one drumstick. 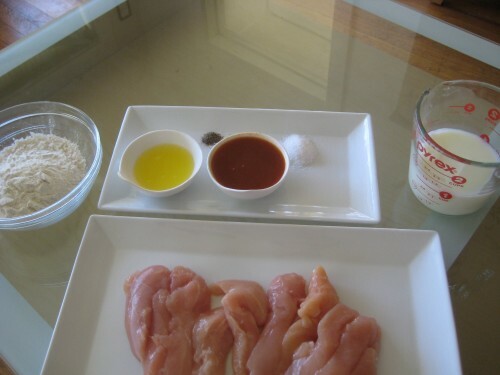 I prefer to buy chicken breasts and cut them into strips because the white meat tastes better and cooks evenly. I also changed the method for breading and frying the chicken, following the process taught to me by my husband’s grandma that I now use every time I make fried chicken. 1. Mix the flour, salt, and pepper in a shallow dish and pour the milk into another shallow dish. 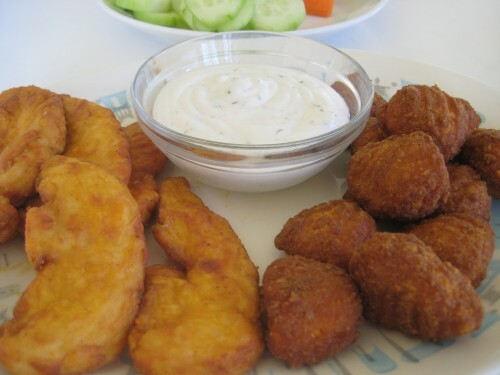 Dip each chicken tender in the milk, letting the excess drain off, and then coat with the flour mixture. Place on a baking sheet or large tray and repeat with the rest of the chicken, reserving the extra flour mixture. Let the chicken sit for 10 minutes. 2. While the chicken is resting, heat the oil in a 12 inch skillet over medium-high heat. Once the 10 minutes is up, coat each piece of chicken with the flour mixture for a second time, shaking off any excess flour, and place chicken immediately into the hot oil. Be careful not to overcrowd the pan, you may have to cook chicken in two batches. 3. Fry the chicken until golden brown and cooked through, about 5 minutes on each side, and drain on paper towels. If the chicken seems to be browning too fast, turn the heat down to medium. 4. In a medium bowl, combine the ketchup, butter, and hot sauce. Dip each piece of chicken in the hot sauce mixture being sure to coat well. Serve warm with ranch or blue cheese dressing to dip them. I was surprised at how fast the homemade chicken recipe went when I timed the process. The frozen chicken had to cook for 15 minutes and rest for 5 more before eating so, with the time it took the preheat the oven, it took a good 25 minutes to cook them. The homemade buffalo chicken was not that much more time consuming, taking only about 30 minutes, but it is more labor intensive. When we tasted the results, however, it was obvious that the results were worth a little extra work. Where the frozen buffalo chicken any’tizers were spongy in texture and bland in flavor, the homemade buffalo chicken was tender, moist, and the perfect blend of spicy and tangy. The pictures below give a good idea of the difference in texture, but the flavor you will have to experience for yourself! The prices below are based on 1 pound of buffalo chicken. Bottom Line: Homemade Buffalo chicken is easy and fast, taking only a few minutes longer than the store bought frozen version and the results are far superior. Homemade is definitely worth the extra time and effort. 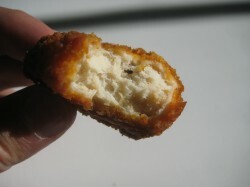 I love chicken tenders and yours look delicious! Also, your blog looks awesome, nice job! I just made them and they are great! I like how much crunchier they are compared to store bought!